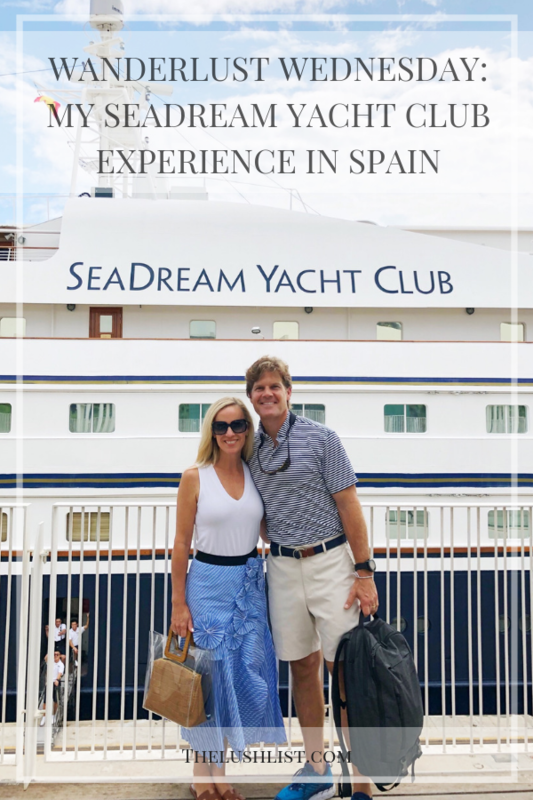 We returned a week ago from our amazing trip with the SeaDream Yacht Club in Spain. 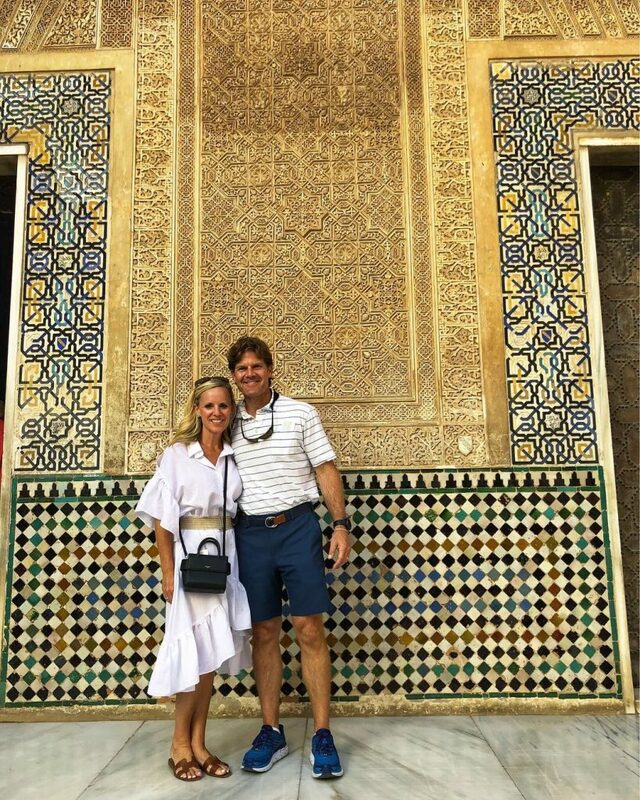 This was truly a dream trip and a fabulous way to see so many wonderful destinations. You can see video of our entire time on the yacht on Instagram Stories Highlights under SeaDream I. I’ve shared my packing list as well as what I wore so now it’s time for all the details of our time on SeaDream I in this Wanderlust Wednesday post. SeaDream Yacht Club operates two identical, luxury mega yachts, SeaDream I and SeaDream II, that spend half the year in the Mediterranean and the other half in the Caribbean. These beautiful yachts have a maximum of 112 passengers and have 99 crew. Our sailing had more crew than passengers! SeaDream is known for their incredible, personalized service, exclusive access to special destinations and amazing food. 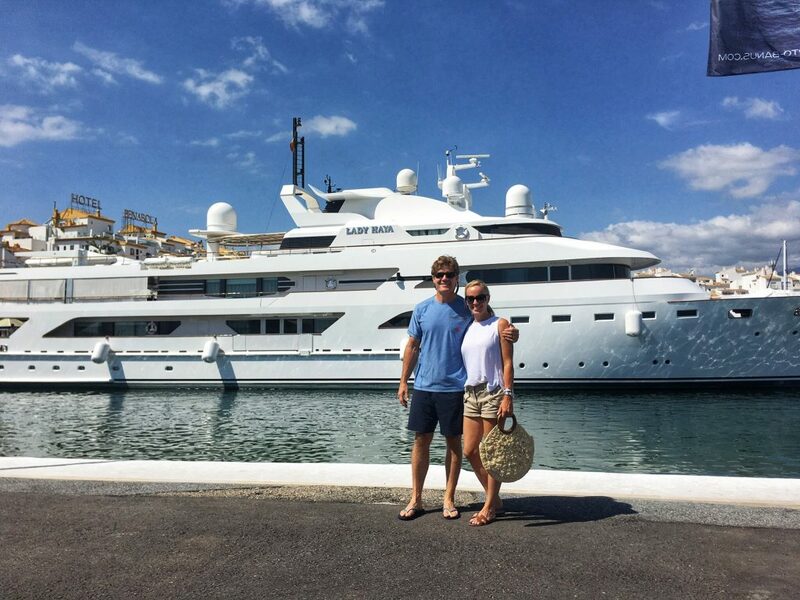 It is their mission to provide a casual yachting experience and exceed expectations. 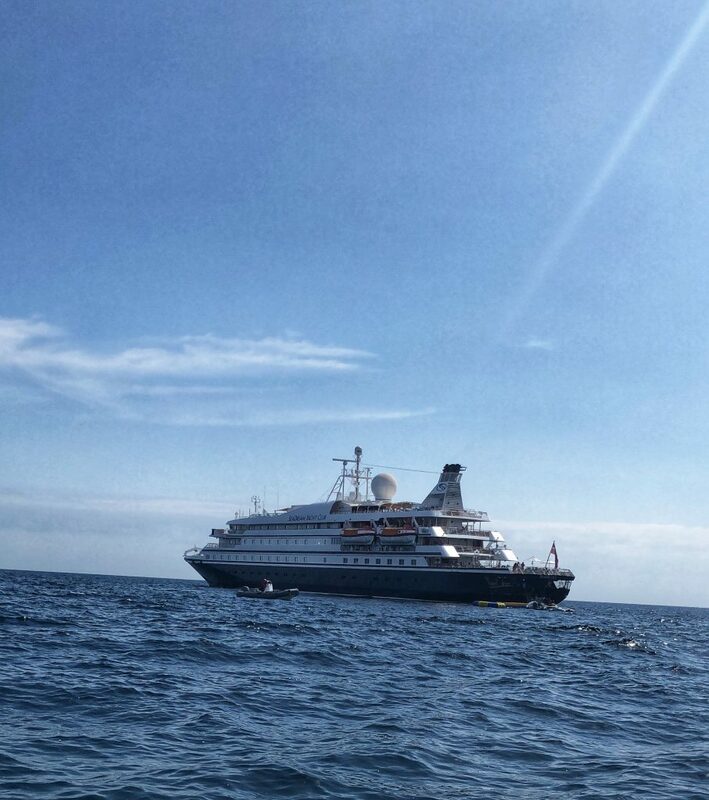 We sailed on the SeaDream I, a 344 ft luxury yacht designed for a luxury yachting experience. Their motto is “It’s Yachting, Not Cruising.” On our sailing we had 97 guests to 99 crew. 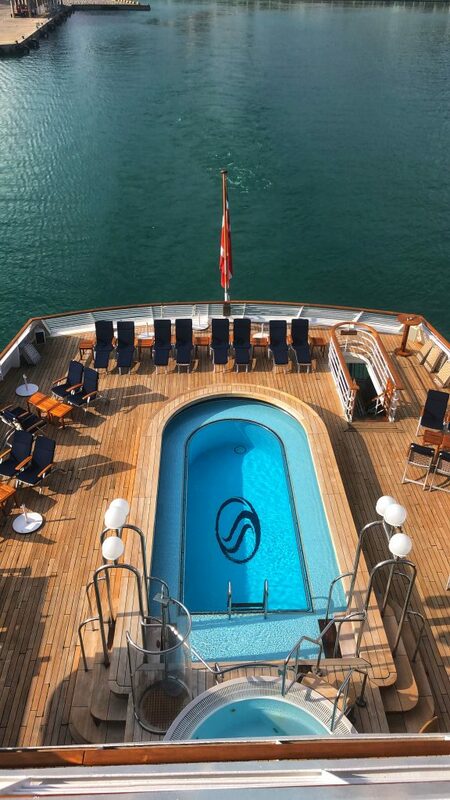 The SeaDream I is a classic yacht with beautiful public spaces and luxurious staterooms. Deck 3 is home to the swimming pool and a sundeck, Main Lobby with concierge, SeaDream Boutique, and the Main Salon where we gathered in the evenings to hear about the next day’s destination and enjoy live music and cocktails. Deck 4, where our state room was located, is also home to the Spa, Gym, Piano Bar, Casino and beautiful Library with computers for passenger use. Deck 5 was the main deck for outdoor dining with stairs leading to Deck 6 and the Top of the Yacht Bar as well as the Balinese Dream Beds, which are a SeaDream signature. This was my favorite spot on the yacht and where I spent a lot of time each afternoon after exploring our current port. These beds are also available to reserve for stargazing or sleeping under the stars. There is also an elegant Dining Room on Deck 2. We only ate here a few times as the weather was so nice it was great to be outside and enjoy the beautiful sunsets each evening. There are a few larger suites about 55 Deluxe Staterooms total on each SeaDream Yacht. Our Stateroom had a living area with custom sofa in Robert Allen fabrics. Across from this was a built-in desk and entertainment area. Our luxurious queen size bed was through an archway and could be closed off by black out curtains. The bed was amazingly comfortable; made up with high quality bedding and lots of down pillows. It’s one of the only beds that I have slept in and not been very ready to get back to my own bed stat! When we boarded the yacht, our Steward, Charissa, was there to meet us and answer any questions. Once we had unpacked, she took our bags to storage. Almost every night, she had a special surprise waiting for us. 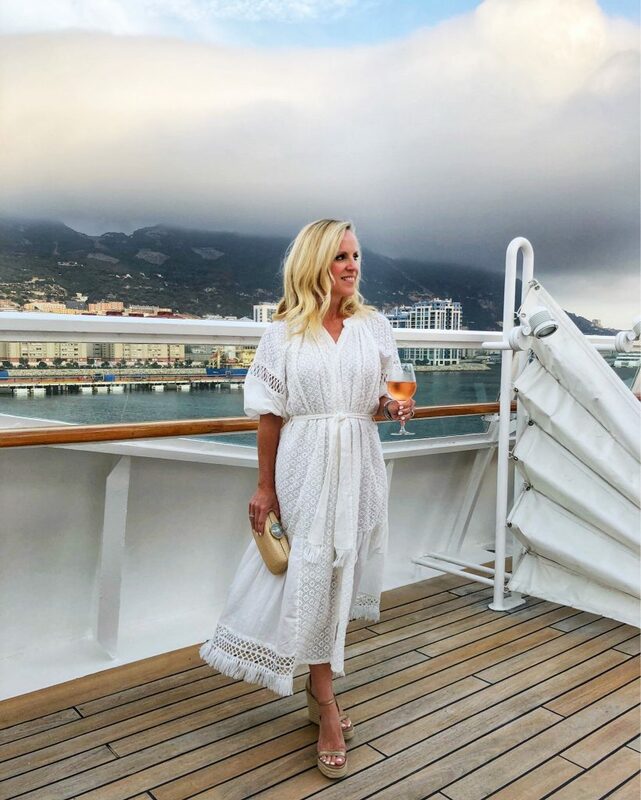 The first night was champagne and strawberries, the second, it was monogrammed pajamas, the next a SeaDream silk sleep mask, and another night lavender sachets on our pillows. One night, Scott asked her if he could have some dark chocolate and she made sure it was in our room each night for the rest of our trip. That is fantastic service and attention to detail! Chef Alastair and his staff are truly masters in the kitchen. The variety of offerings was truly outstanding. From haute cuisine to raw and everything in between. Nothing was too much to ask. If you liked to something one night and wanted it again, Not a problem! Feeling like a fresh green juice with your latte in the morning? Not a problem! Spent a little extra time in town and missed lunch? Not a problem! Simply ask Mikee, Frank, Doramus or Juan and they’ll happily bring you a menu. Francisco and Vladan were always ready at the Top of the Yacht Bar to serve fresh Sangria or mix a Margarita to your specifications. You know I’m picky about my Margaritas and they got it perfect each time. One evening we were having dinner on the late side so Scott ordered a cheese platter and wine to be delivered to the room. Truly, any request is happily granted. Something to note about all of these dining options and special requests is that everything is included. Special juices in the morning, cocktails in the afternoon, room service menu and wine and cocktails with dinner. 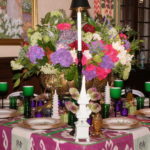 Each evening, the sommelier had chosen several wines for the evening that paired with the menu and typically showcased a European or regional Spanish wine. Each one was wonderful. They do have a very large wine cellar with additional wines for purchase, if you’re so inclined. Breakfast and lunch were available several hours each on Deck 5 and 6 with Deck 6 being my favorite spot any time of day. There is a little secret deck off the back of 5 that accommodates about six tables. Be sure to ask for a table there at least one night! 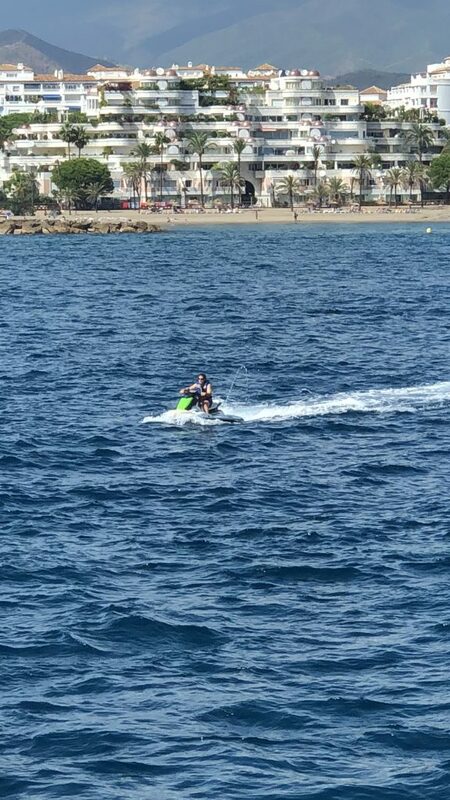 There are many activities on the yacht as well. 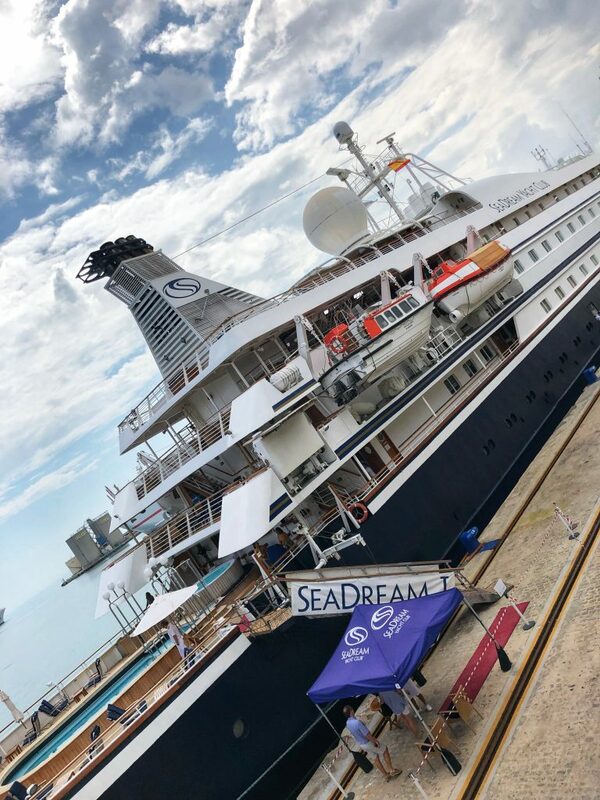 Each SeaDream yacht features a Thai-certified spa with massage, facials, nail and hair services; golf simulator, pool, several sundecks, a casino, a piano bar, the Top of the Yacht Bar, and water activities including jet skis, waterskiing, wakeboards, Hobie cats, paddle boards, water banana and a water trampoline. 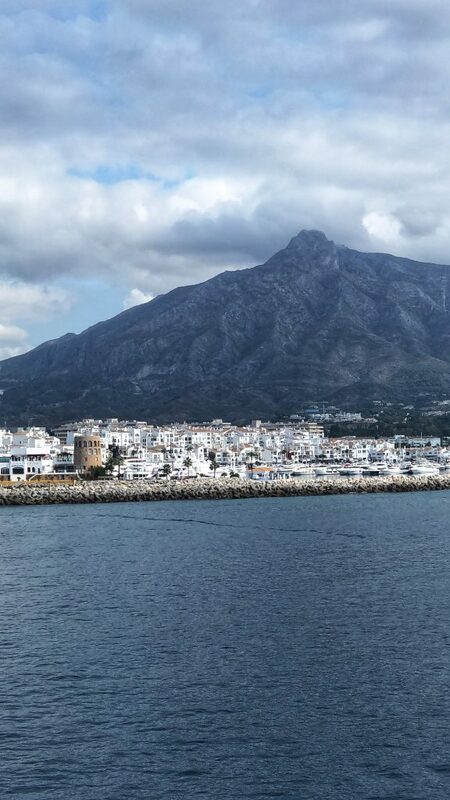 Our sailing was along Spain’s Costa Del Sol. 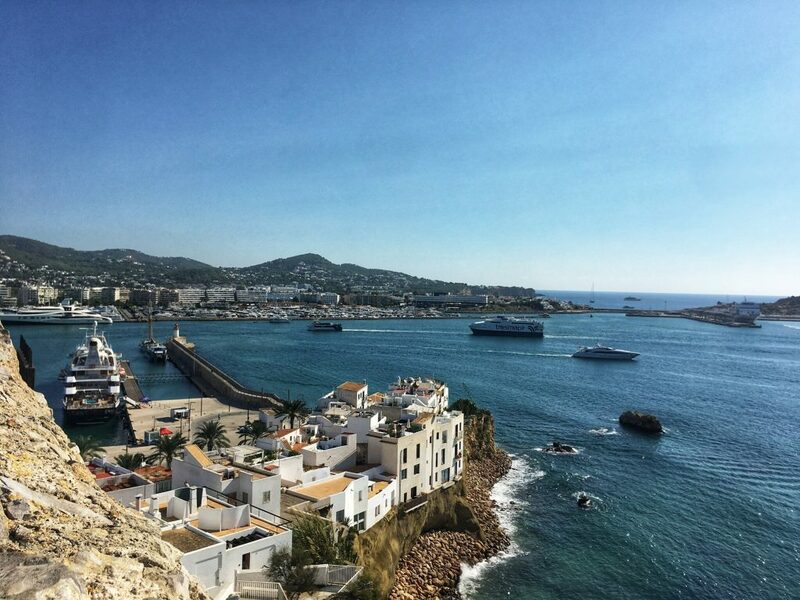 We began in Malaga and made stops in, Puerto Banus, Gibraltar, Cartagena, Motril/Granada, Denia, Ibiza and Barcelona. 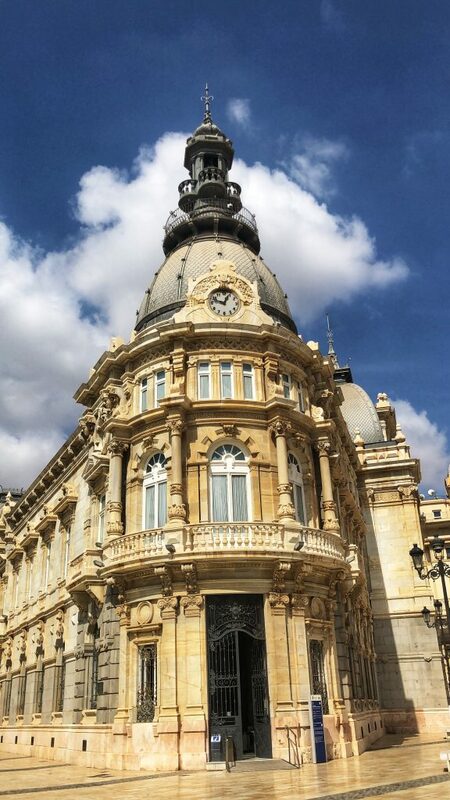 We flew from DFW to Madrid and then took the high-speed train on to Malaga. 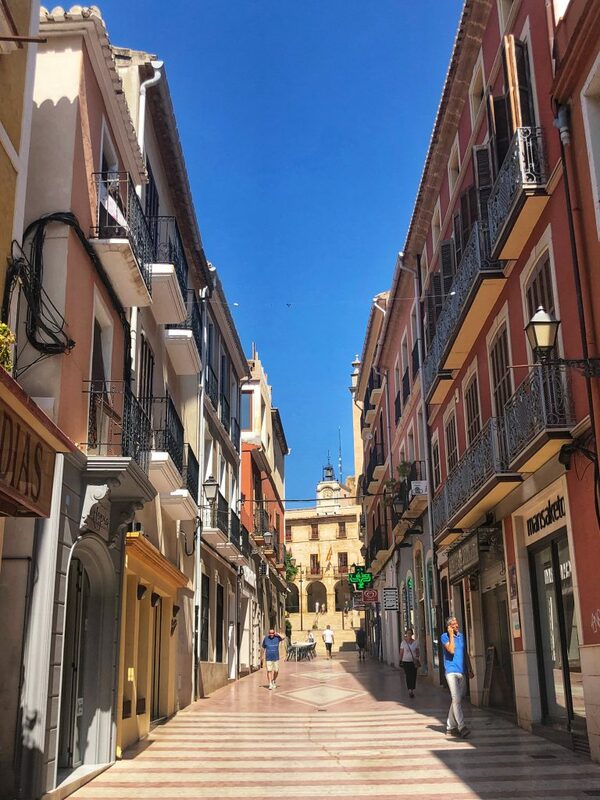 After checking into the Hotel Gran Miramar, We spent the afternoon wondering this darling town. We had lunch at Cafe de L’Abuela near the Picasso Museum and toured the Malaga Cathedral and Roman theater. We had dinner at the Chill Out Bar at the top of the Gran Miramar overlooking the beach and actually met two couples boarding the SeaDream I the next morning there! After breakfast in their blue and white pool-side restaurant, we visited the Picasso Museum. 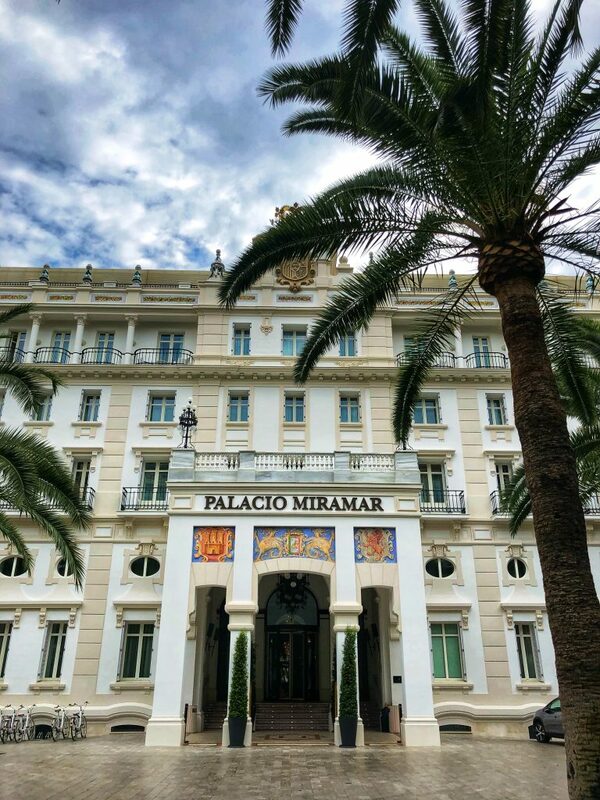 Picasso was born and raised in Malaga and his family has created this museum with many never before seen works. Pro Tip: Buy your tickets online even a few minutes before you want to go and walk past the very long line! The photo above might be one of my favorite from the trip. Do you notice the fun crew in the lower left corner? Everyone was warm and friendly from the very beginning! After watching our departure from Malaga into the deep blue Mediterranean Sea, we got settled in our room. Before dinner we met for cocktails in the grand salon to hear about the next day’s destination. 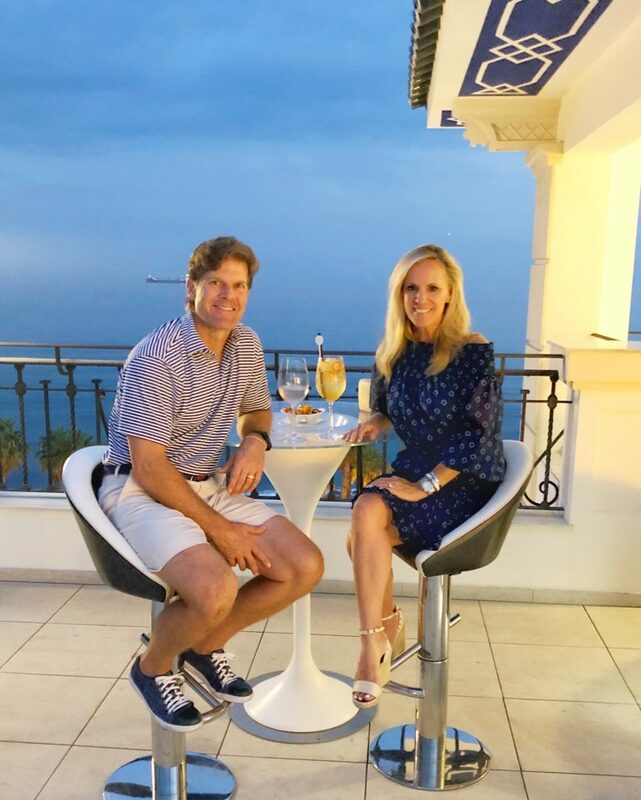 Then we went to the Top of the Yacht Bar to watch the sunset, my favorite daily activity! 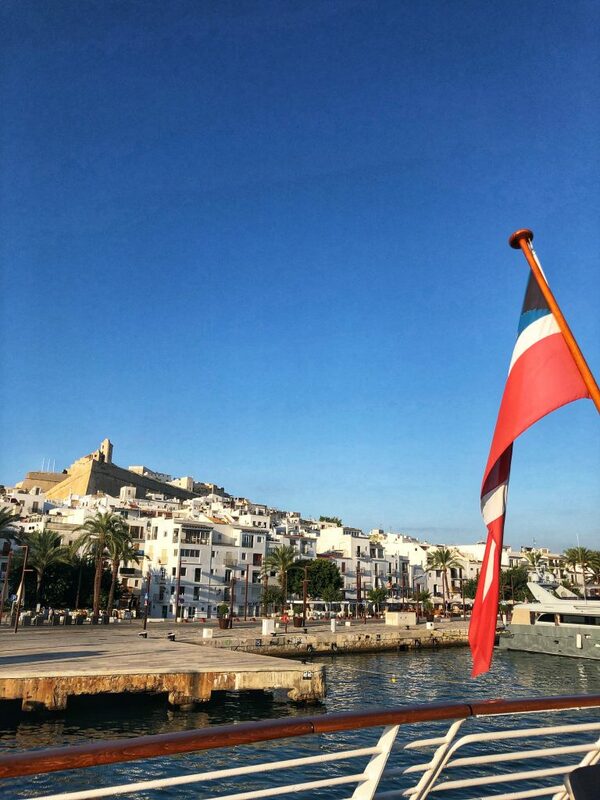 SeaDream is the only commercial sailing yacht allowed access to this private, luxury marina to the west of Marbella founded by Jose Banus in the early 70s. 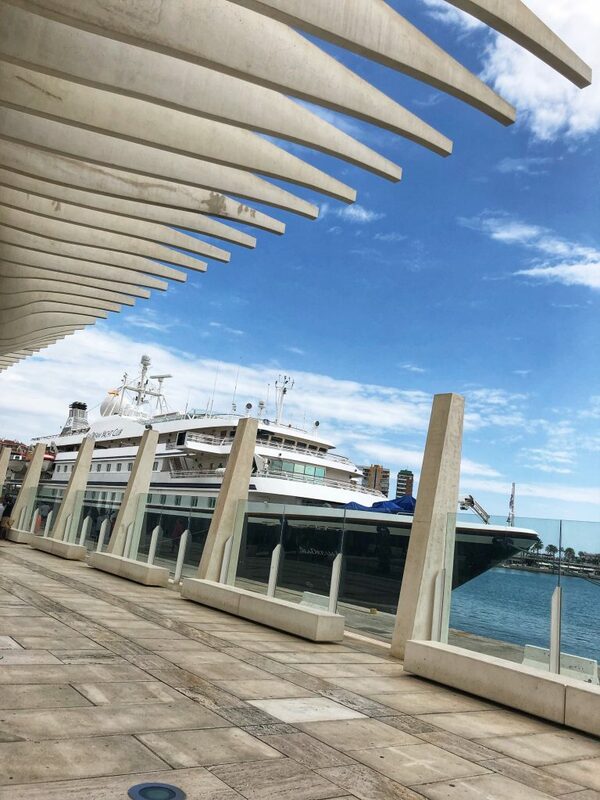 We arrived early this first evening after leaving Malaga and after dinner went into town to see the amazing private yachts lit up and check out the nightlife. The next morning, we slept in a bit and then went back into town to do some shopping and more luxury yacht viewing. Every luxury brand you could think of was in this tiny, glittery port. We went back to the SeaDream Yacht for lunch and then I read on the top deck as Scott jet skied. 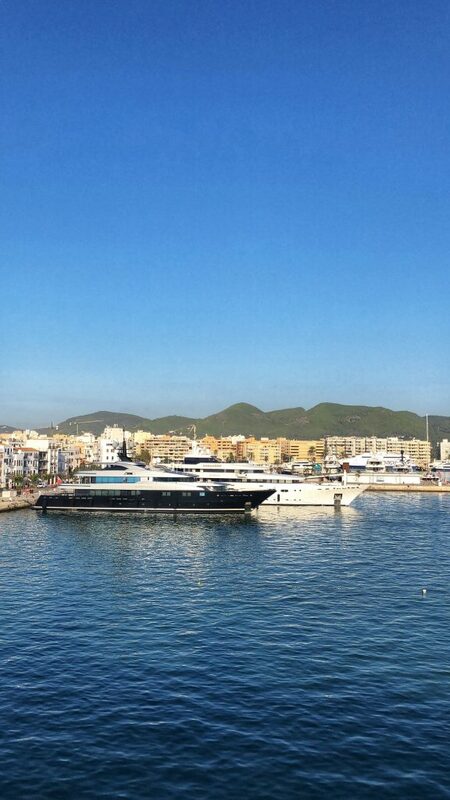 Anytime the yacht is moored outside of a port, all of the water activities are available. They coordinate times for those that want to swim as well. 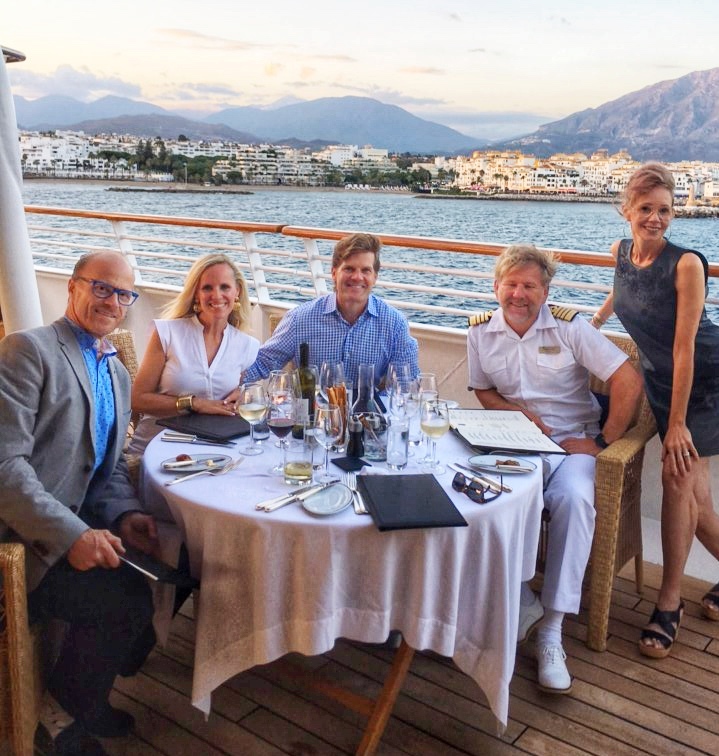 That night we enjoyed dinner at the Captains table with new friends from Canada as the yacht pulled out of port. 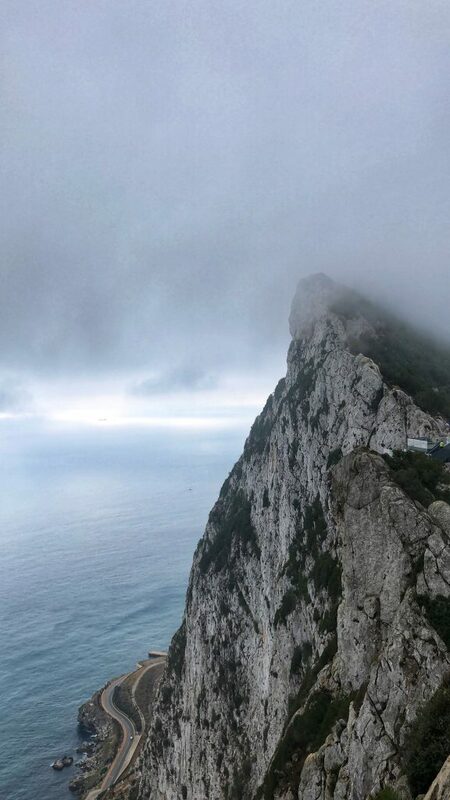 The next morning we woke up in the UK territory of Gibraltar. 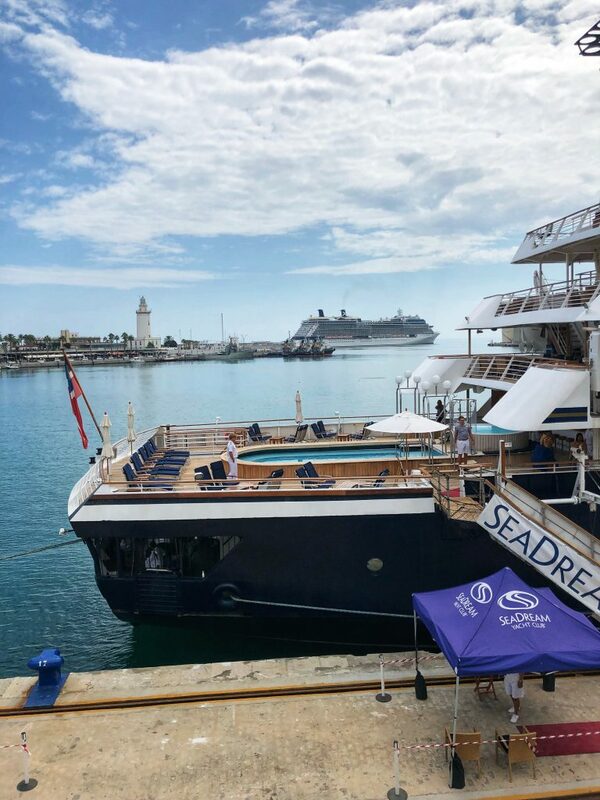 The photo above shows you a great perspective of the SeaDream yachts in comparison to a large cruise ship with about 3500 passengers. We spent the morning touring the Rock of Gibraltar and the Great Siege Tunnels. This was one of the two excursions that we did during our trip. We went with about 10 others on this tour. 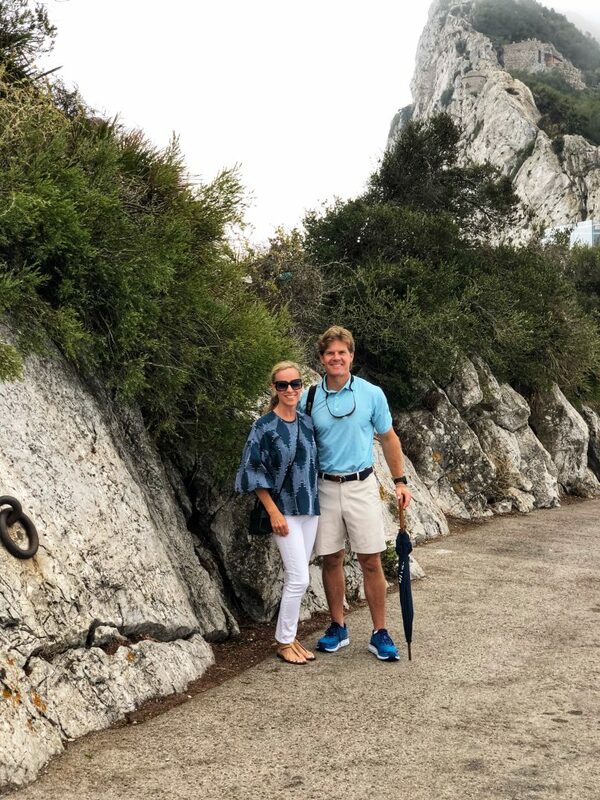 We rode the cable car to the top of Gibraltar where we heard the history and importance of this small territory (only 6 square miles) and saw the famous Rock of Gibraltar as well as the monkeys. It was foggy but still had beautiful views of Spain, Africa and Gibraltar. After returning to the yacht for lunch, Scott and another guy took two of the mountain bikes that are provided by SeaDream back up the trail to the top of the Rock of Gibraltar. The second excursion we did was here in Granada. 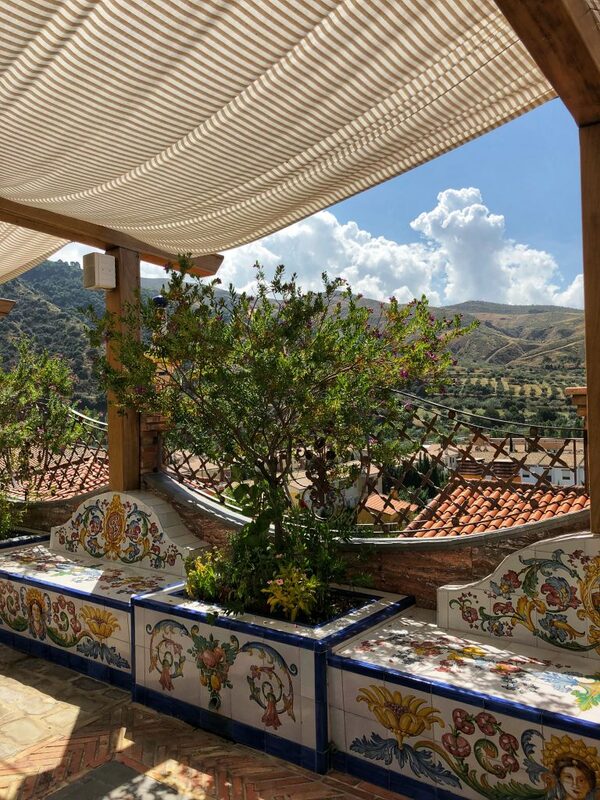 With about 15 others we boarded a luxury bus for the 45 minute drive to ancient Moorish city of Granada in the Sierra Nevada mountains. 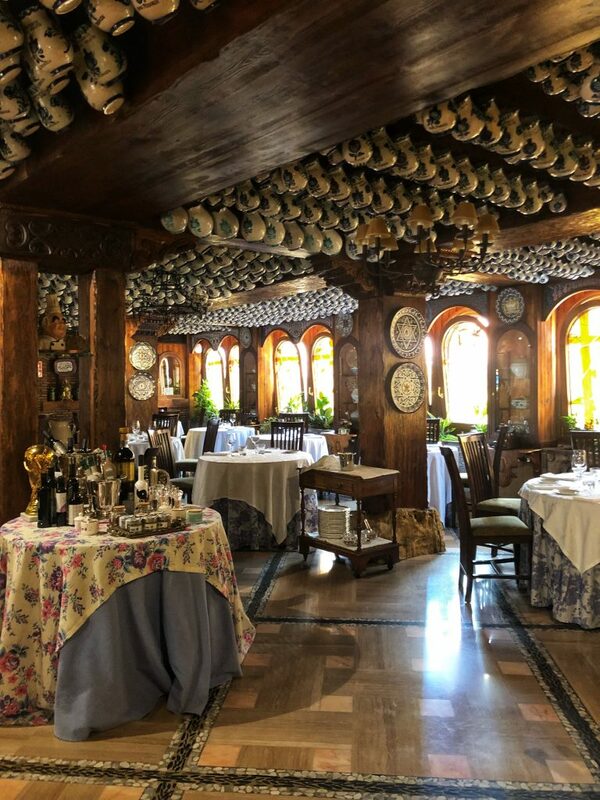 We had lunch at Restaurante Ruta Del Veleta, which is King Juan Carlos‘ favorite restaurant in the area. 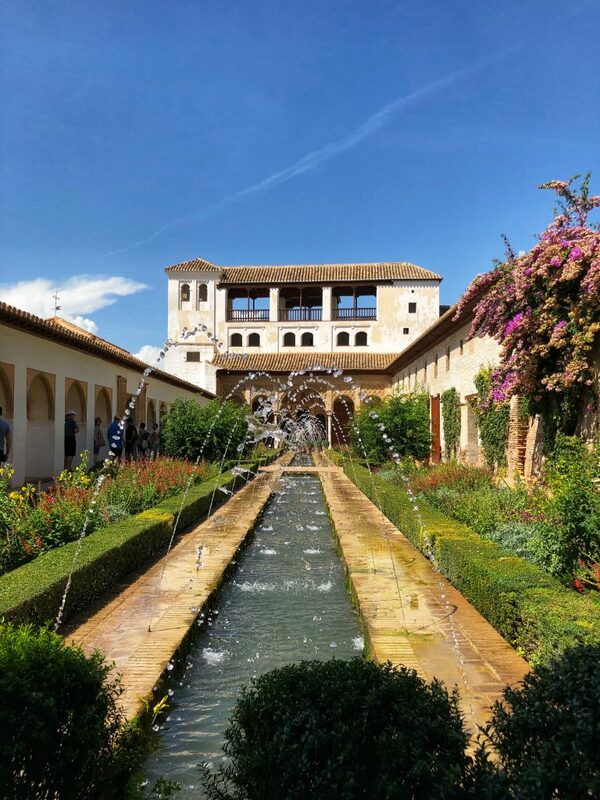 Our guide then took us to the incredible palaces of La Alhambra. She was a native of Granada whose father is also a guide at La Alhambra so she really knew the history and details. 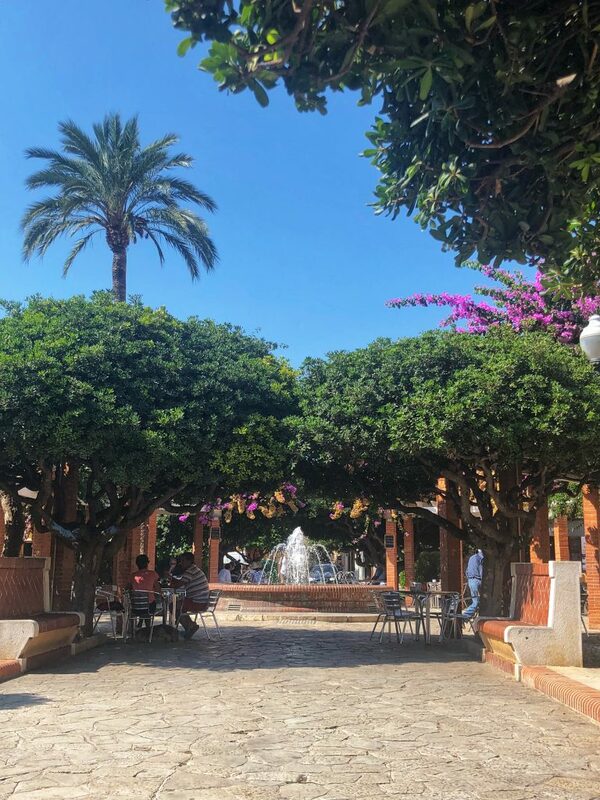 After doing so much traveling this summer and arranging it all myself, I cannot tell you how fabulous it was for someone else to find the best guide, restaurant and itinerary. All we had to do is board the bus! I heard the same comments from others who did the excursions in the other ports as well. This beautiful, quaint city has been a major naval port for centuries. The SeaDream docks in the center of town making it easy to stroll the marble paved streets and experience it’s diverse cultural heritage. 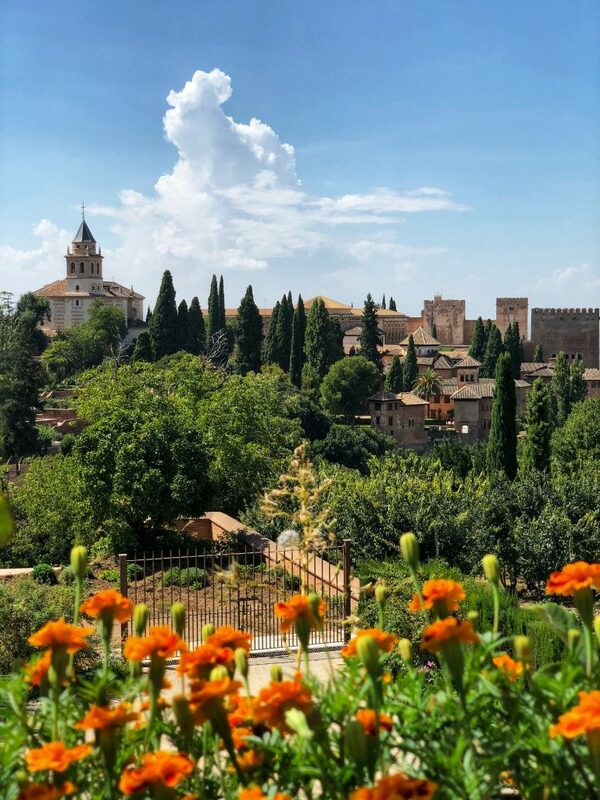 We visited the Mill Hill for a stunning view over the city as well as the Teatro Romano, the Roman theater, for a look inside the history of this town. There are several archaeological sites to visit here as well. We chose a cute restaurant on a side street called Nuestra Tradition for sangria and tapas for lunch. I was clearly on a quest for the best Sangria in Spain. 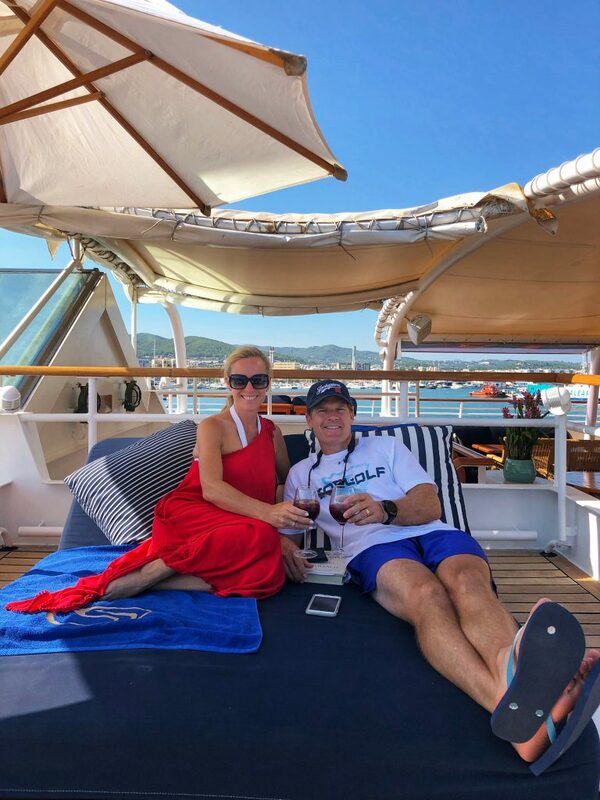 We spent the afternoon relaxing and reading at the top of the yacht and my favorite spot, the Balinese dream beds. Then enjoyed the Chef’s Tasting menu in my favorite dining spot for watching the sunset. After leisurely breakfast on the yacht, we walked the tree-lined streets of Denia. 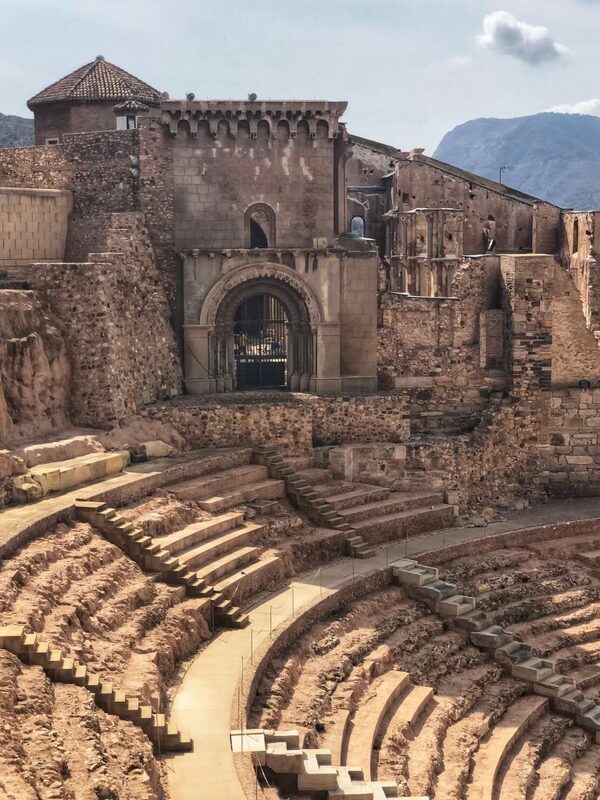 Larger than the other ports we had visited, this town is also rich in Greek, Roman and Islamic history. We hiked to the highest point to the iconic castle overlooking the city. We returned to the yacht for our Thai massage appointments in the Spa. I had a 90-minute back massage with custom facial. Scott opted for the 90 minute Thai massage. 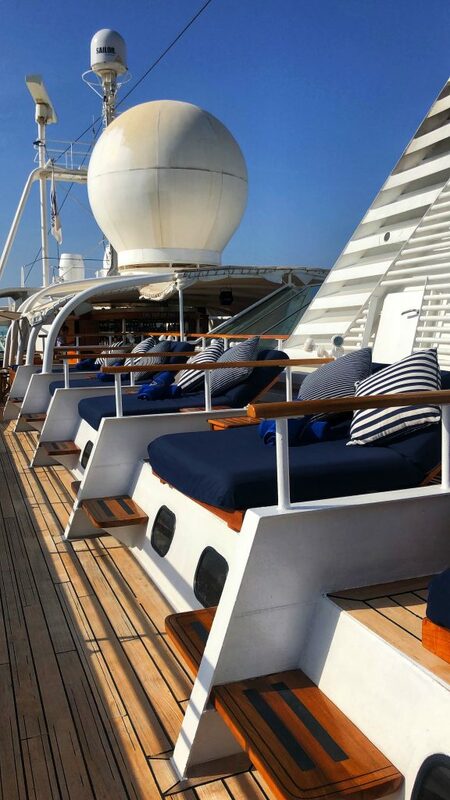 On both SeaDream yachts the Spa is staffed with certified Thai massage therapists. Everyone on the yacht was so friendly and we met so many interesting people. This night we invited new friends from Germany to join us and the couple from Canada we met the first night for dinner at one of the tables at the Top of the Yacht Bar deck. It was fun to see this iconic port in person. It is as beautiful as you would imagine. Scott and the same adventurous friend from the Gibraltar bike/hike took the mountain bikes once again but this time were led by a professional triathlete and a professional mountain biker. They biked down the coast line and up to the fort at the top of Ibiza. When he returned, we walked the famous boardwalk and admired again so many incredible private yachts. 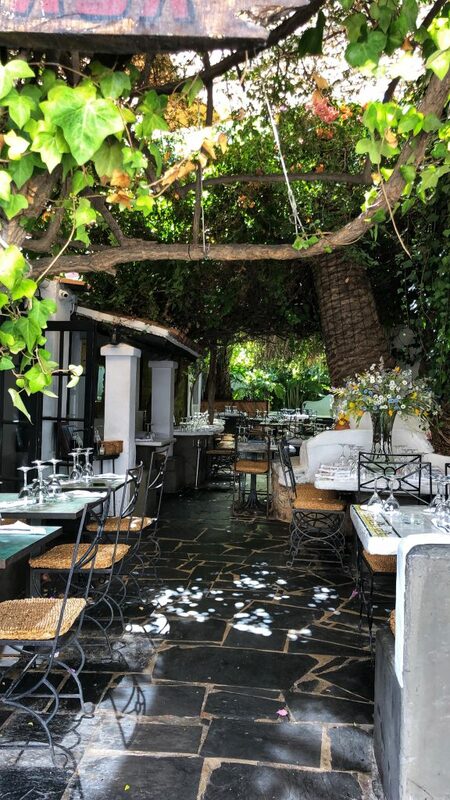 We found the most darling restaurant called Ristorante Jardin La Brasa where we enjoyed wonderful paella, tapas and more sangria! I then returned to my favorite spot on the yacht to finish my friend’s book and start a new one. This night we were invited by the mountain biking buddy to celebrate his birthday with other friends on the lower after dining deck. The best place for dinner in my opinion! The next morning, we very reluctantly disembarked in Barcelona. After an amazing week on SeaDream I and being pampered at every turn by the incredible crew it was definitely bittersweet! Sailing on a SeaDream Yacht is definitely one of the best travel experiences I have ever had. I can certainly understand why more than 90% of their guests return. 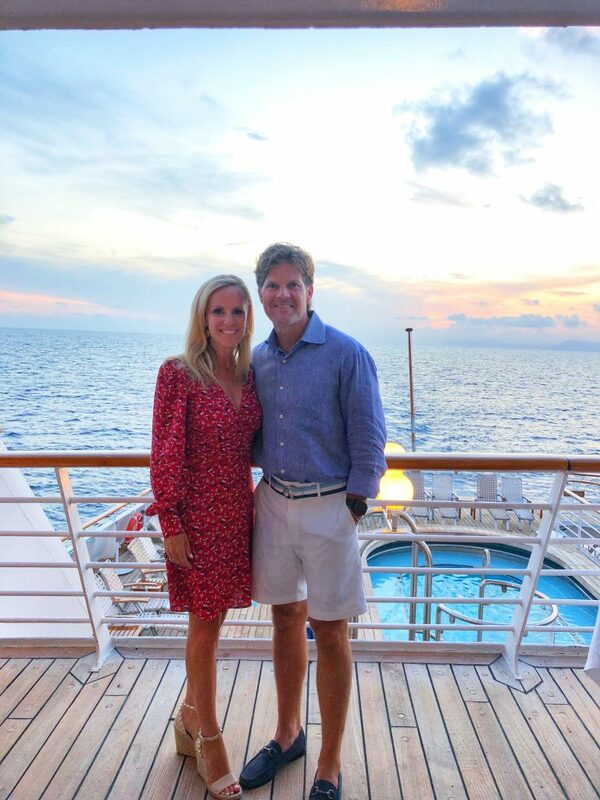 One couple we met has spent more than 195 night aboard the SeaDream yachts. This is like visiting your favorite hotel where the staff knows and cares about you but it is in a different location each time you return. We cannot wait to return and are looking at a sailing next fall. I also think I’m going to check into taking the girls on a family trip to the Caribbean soon! I’ll be sharing more about these ideas soon but you can read more here. 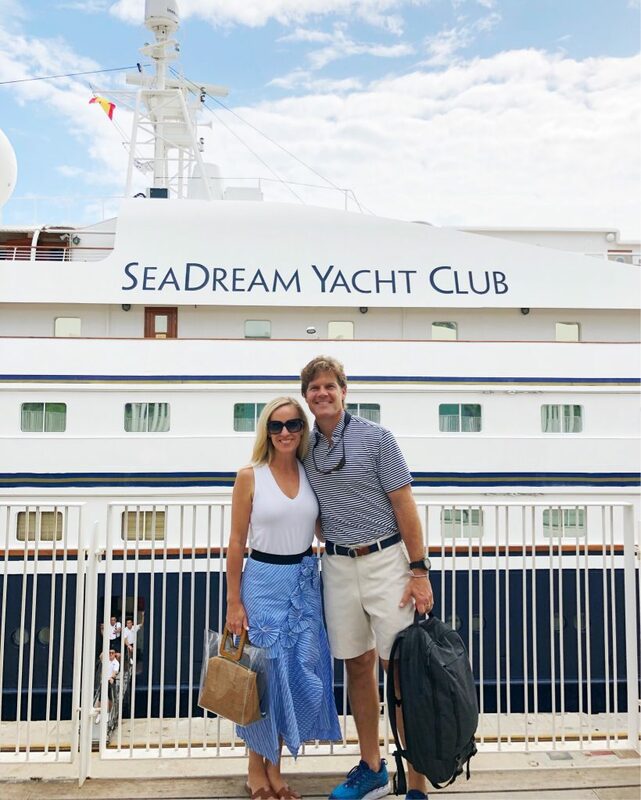 Thank you to SeaDream Yacht Club for having us as their guests and to Kelly Gruber of Sherry Lane Travel for arranging all of our travel. Kelly is a travel contributor to The Lush List and a luxury travel agent based in Dallas. If you have questions about sailing on a SeaDream Yacht, please contact Kelly as she has wonderful gifts to offer anyone who books on SeaDream. All opinions, Itinerary, and activities selections were my own.